Most toddlers wake up brimming with energy and ready to start jumping on the couch the minute they wake up. If your toddler normally fits that pattern but suddenly wants to lie on the couch all morning instead after what seems to have been a good night's sleep, you may be — and should be — concerned. He could be getting sick or something may be keeping him up at night. Or he might just not be a morning person. Whatever the cause, fatigue in a small child after a good night's sleep warrants evaluation. Toddlers, like adults, wake up in different ways. Kids destined to become morning people wake up ready to jump into anything and everything, while the night owls of tomorrow wake up slowly and stay grouchy and groggy for an hour or so after they wake up — just like many adults. If your child still acts sleepy after a full night's sleep, he might just be a night owl rather than a morning person, baby sleep coach Nicole Johnson explains, citing noted pediatric sleep expert Dr. Richard Ferber. Like adults, children need varying amounts of sleep. While you may consider the amount of sleep your child gets as "enough," she may be one of those people who loves to sleep and who needs an hour or so more than most people to face her day with a smile. The average 2-year-old needs between 10.5 and 12.5 hours of sleep at night, plus a 1- to 3-hour nap each day, according to the BabyCenter website. Evaluate your child's sleeping patterns to determine if she's really getting enough sleep — the University of Michigan Health System notes that sleep deprivation could be an issue if, for example, you need to wake her up most most mornings, if she falls asleep regularly during car rides or seems cranky or hyperactive during the day. If she goes to bed at 8 p.m. and you wake her at 6 a.m. to get her to daycare, she may not be getting enough sleep, depending on her needs. If your toddler just started acting tired after a full night's sleep and if he isn't just going through a growing spurt or recovering from an illness, look for other causes. Is he pale, weak and irritable? He could have an iron deficiency or other illness that's making him excessively tired. A visit to his doctor for a physical and blood work to rule out the more common causes of childhood fatigue can set your mind at ease. Does he wake up frequently at night? 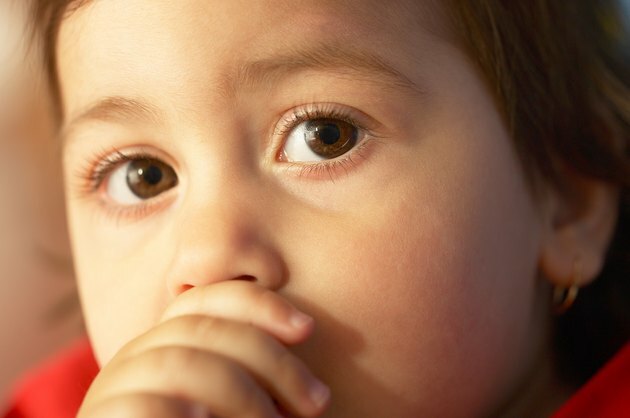 Toddlers often start to develop fears and may have nightmares that disrupt their sleep. Overstimulation before bedtime or scary TV shows could not only disrupt sleep later but could also make it hard for your toddler to fall asleep. Fatigue in a child that lasts three or four weeks needs evaluation, pediatrician Dr. Stuart Crisp advises. If your toddler has other symptoms in addition to fatigue, such as pallor, blood in the stool, swollen glands, easy bruising, frequent urination and thirst or shortness of breath, see your doctor immediately. Some serious childhood illnesses, like leukemia, thyroid disease, heart disorders and diabetes can first appear as fatigue. But these diseases affect only a small percentage of children; look for more common causes for the morning blahs before worrying about the more serious possibilities. BabyCenter: How Much Sleep Does Your Child Need?